If you’re like Suzi Perry and can’t do anything without an iPad in your hands, the G-Hold Micro Suction is for you. A lightweight plastic stick-on clasp that allows an iPad to be securely held in one hand, it makes hanging around with a tablet that much easier. It’s simple, ingenious stuff; you stick the 4.5-inch diameter G-Hold Micro Suction to the back of any tablet, extend the slide-able clasp and slide in between your index and middle fingers. The whole thing even rotates through 360 degrees, too. Whether your average traveller absolutely needs a G-Hold Micro Suction is debatable, but anyone working – or speaking – at conferences (especially those controlling projector feeds and other displays), will find it a God-send. However, just for simple reading the G-Hold Micro Suction makes a play; we found it much easier to support a heavier-than-it-looks iPad mini in one hand while thumbing through a guidebook. If you think it’s socially acceptable to take photos using an iPad (it’s not), it helps with that, too. Our only concerns about the G-Hold Micro Suction are that once attached, it renders the iPad holdable and portable, though restricts it being used as ‘normal’. For instance, with the gadget fastened to its back, it’s tricky to use an iPad on a flat surface, bouncing at the corners when pressed anywhere away from the centre. 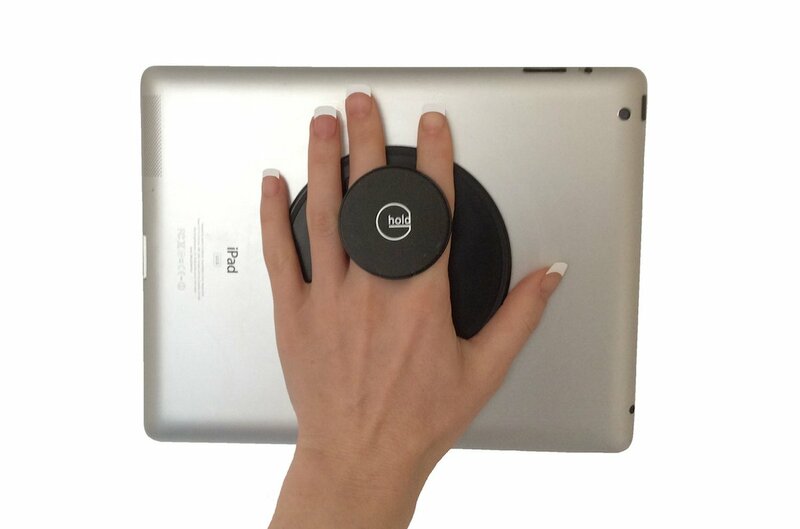 It’s also a gadget that will appeal only to those who love using tablets au naturel, i.e. unprotected; anyone holding up an iPad to the night sky while using a stargazing app will initially love the G-Hold Micro Suction for its ease of hold, but might feel a tad edgy about dropping it. However, since the G-Hold is removable, and re-attachable, there’s no problem aside from storage – perhaps a small pouch to store theG-Hold Micro Suction when it’s not being used would be a good addition to the packaging. An extended second position that creates a stand for the iPad (it would need to lock into place) would be a good addition, too, but as it is this low-cost device should find many friends among mobile pad-users after some productivity.